I recently travelled to Merrylands to visit one of SVA’s Bright Spots Schools – Merrylands East Public School. The occasion of my visit coincided with the launch of a partnership between SVA and Merrylands East Public School (MEPS) on the five-year Bright Spots Schools Connection project. It gave me an opportunity to shadow the photographer capturing the event, gain a better understanding of the role of a photojournalist in documenting SVA’s work and for me to learn more about photography. However, I learnt much more. 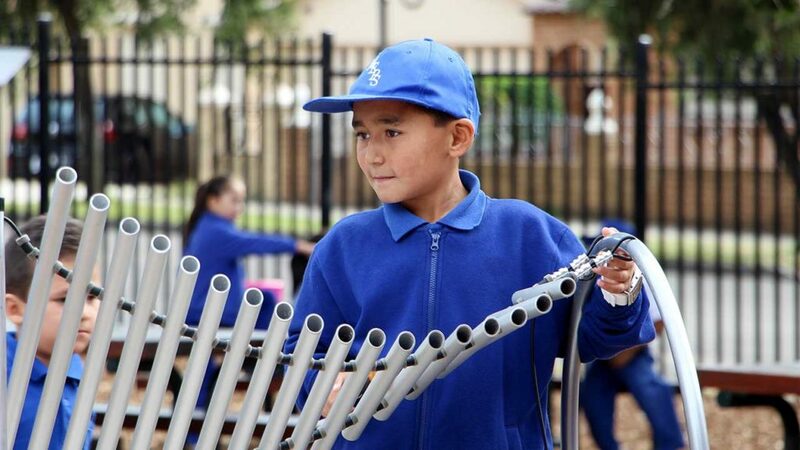 Merrylands East Public School represents the changing nature of Australian schools. You can see it etched in the faces of smiling children from 40 different social-cultural backgrounds as they sit and count to 100 in class or race around outside with endless energy at recess. The physical transformation of the school too, to learning spaces designed in a non-traditional layout, tell of a school very much shaping its own destiny. The formal launch of the partnership had speakers from Years 2, 3, 5, 6 and the Alumni introducing their unique school to the group. Their stories gave us an insight into how the range of different education techniques adopted by the school has benefitted them. It’s a world that my inner school child yearned for. Rows of desks, now so last century, have been replaced by round tables, booths and bean bags; kids work on whiteboards, computers, laptops and iPads. Small groups huddled in corners, others chatted in booths, and one young man worked outside on a bike with the mature insight that he ‘just learnt better this way’ and an innocent generosity that he ‘would give it away’ when the bike was finished. Another spoke to the group of how he ‘was going to be a mechanic’, but then realised he ‘…could design flying cars’. Three girls are developing a multiplayer interactive craft game and another even younger girl has just written and designed an online ad for her future company. This school is exploring learning in ways that were yet to be thought of and most likely deemed impossible when I went to school. What struck me at recess (or ‘little lunch’) was the beauty of children and the friendships and bonds they create when in a safe and opportunity-filled environment. Once they were comfortable talking to the person behind the camera many came up to me asking for ‘photos of me and my friends’. If great outcomes are the product of high quality learning and experience, MEPS is clearly on target for great success. Although there is much to be done in our schools around how we educate and how we can improve equity, there is also much to be done in the field of learning; irrespective of our age.